last Saturday (Jan. 5) at First Congregational Church of Akron. 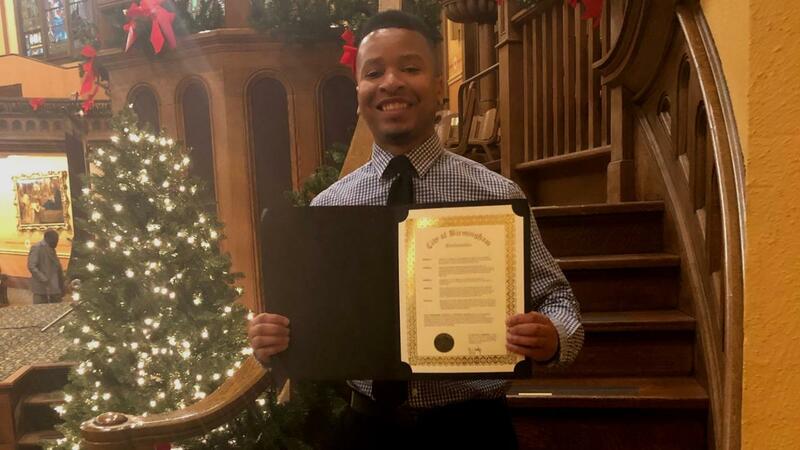 Nowden was honored for his work creating the Black Girls Rock - Akron's Family Day Event on July 12 at Canal Park. The successful fundraiser was created to help support African-American women and Akron's entire African-American community. He was presented the award by City of Birmingham (Ala.) Mayor Randall L. Woodfin. "The entire RubberDucks organization is extremely proud of Thryan for receiving this honor. It is truly special to have his efforts recognized by the Mothers On A Mission organization," said RubberDucks General Manager Jim Pfander. "Thyran continues to set the bar high for outstanding work in the community in which we live, work and play." Mothers On A Mission started the MLK Drum Majors Awards started in 2006 to celebrate the holiday honoring Dr. King and serves as advocates of social, racial, and ethnic harmony-cornerstones of Dr. King's dream for justice, fairness, and equality. Mothers On A Mission annually presents the awards to community leaders, everyday individuals, and organizations who demonstrate the principles set forth by Rev. Dr. Martin Luther King, Jr. The civic organization is an advocacy support group for families that provides volunteer services, ministry, and scholarships to young people who have parents in prison and who want to attend college. For more information about the team, please visit the RubberDucks' website, www.akronrubberducks.com, Facebook page www.facebook.com/AkronRubberDucks, Twitter feed @AkronRubberDuck, and Instagram at @akronrubberducks. Tickets packages for the 2019 season can be ordered online or by calling 330-253-5151 Monday through Friday, from 9 a.m. to 5 p.m.